I love working with a theme. 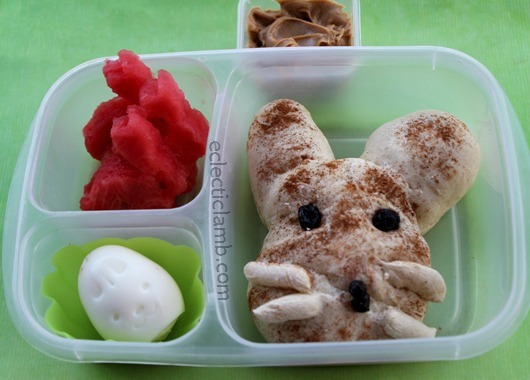 Here are 8 Easter themed bento lunches. I included many common symbols of Easter: eggs, lamb, chicks, basket, cross, and bunnies. This lunch was previously published here. When making calzones for dinner, I made a few in Easter egg shapes to use for lunch the next day. 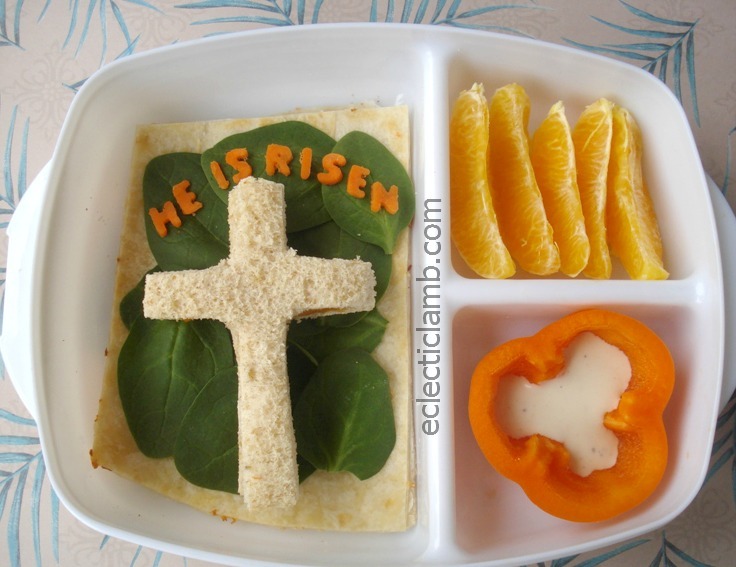 I enjoyed creating these Easter lunches using many of the common symbols of Easter. If you try any of these, I would love to see a photo of your meal. 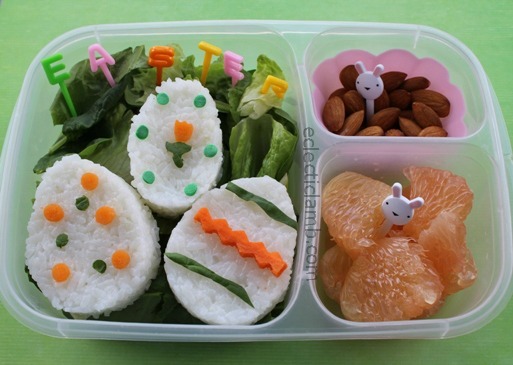 This entry was posted in Bento / Cute Food, Food and tagged bento, easter, shaped bread, vegetarian. Bookmark the permalink. What creative ideas! Very neat. Your food is always so creative! Awesome! Love how you decorated pistachios as Easter eggs, so creative! Awesome! You are so creative! 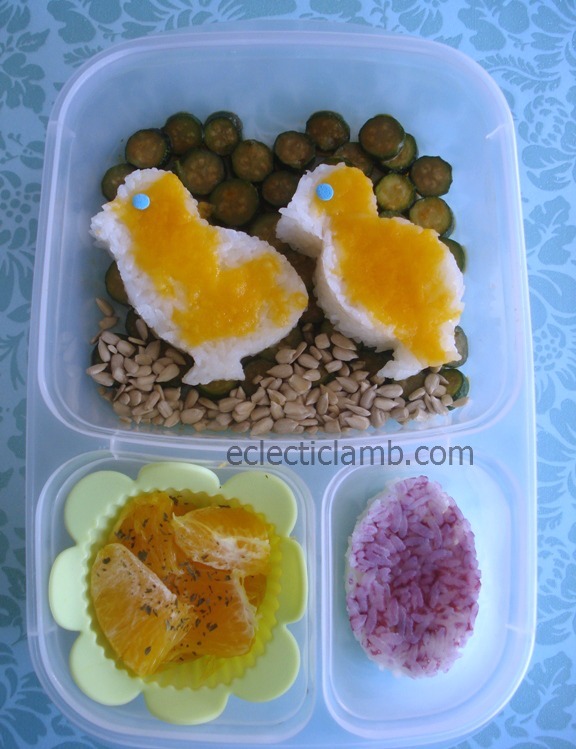 Excellent bento collection! 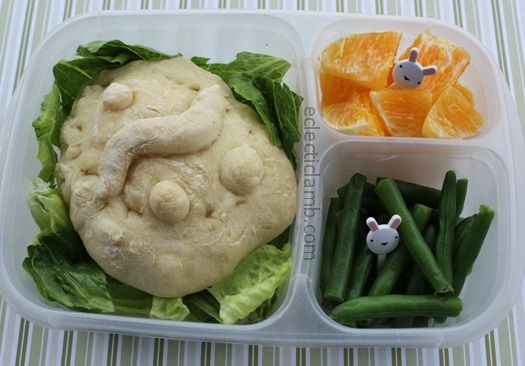 Love the variety of ideas and ingredients you put in your lunches. The bread basket from last Easter is still a winner! Thank you! 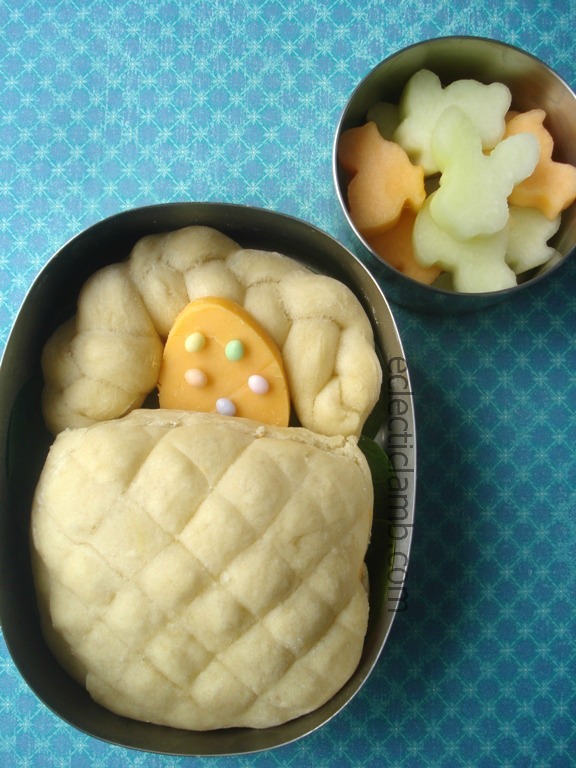 Sometimes I make cute food for kids but I also make it for myself and other adults. Wowow! 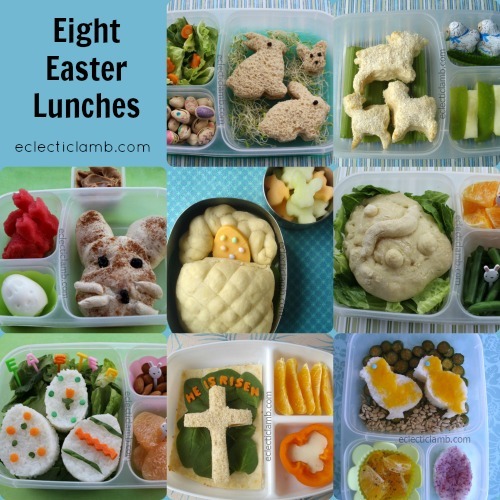 you have really awesome easter bento lunches! 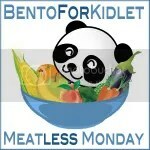 Wish you had been writing this blog when my girls were little. So clever! Thanks so much for sharing! 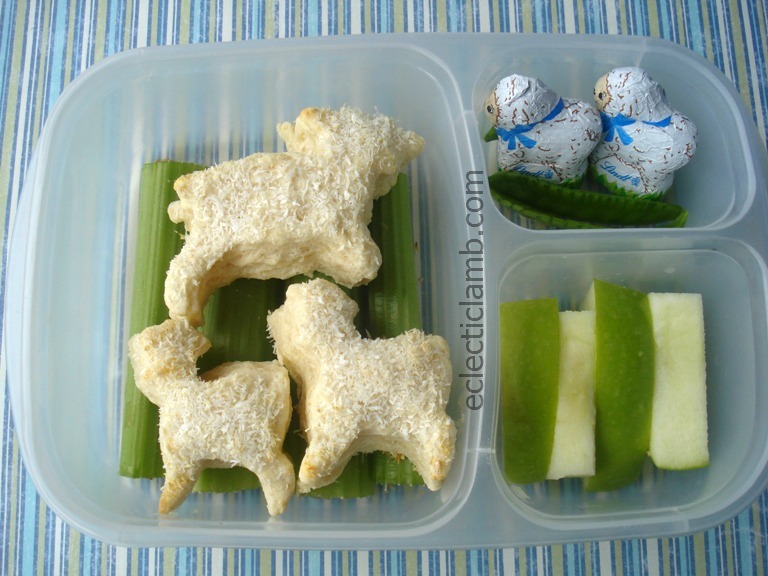 This is a gorgeous round-up of lunches, I love them all! 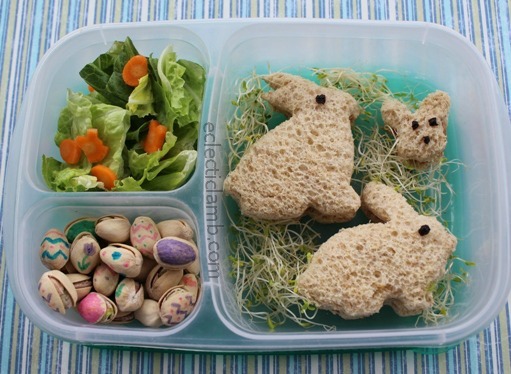 You saved the best till last though, I adore the pistachio eggs and the little bunny sandwiches on the sprout ‘grass’ are so cute! Thank you so much for hosting Grace!